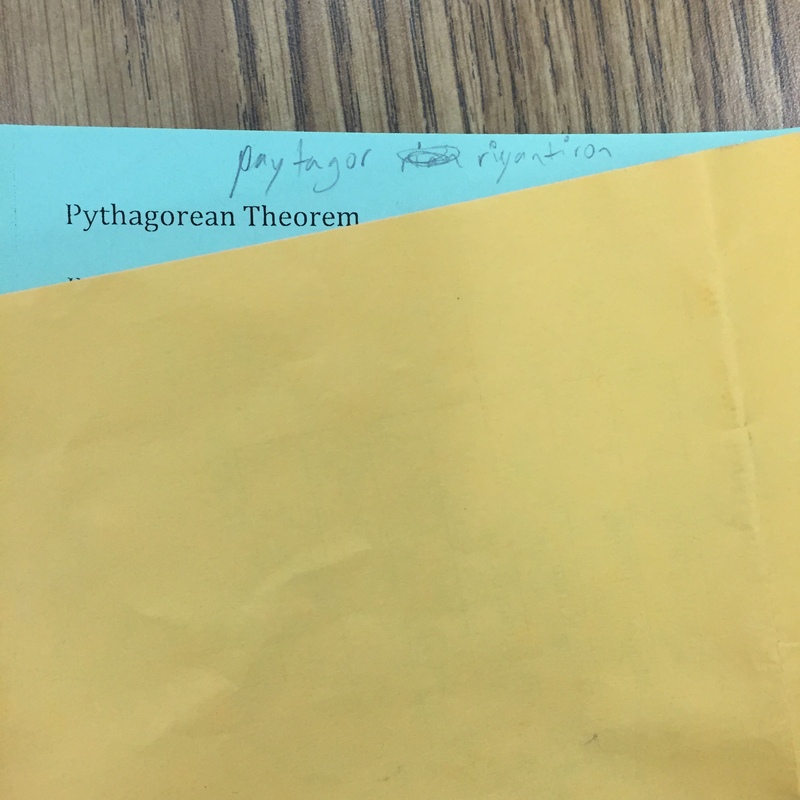 In unrelated news, my favorite thing to do this unit is add “Pythagorean” in front of whatever the lesson is. 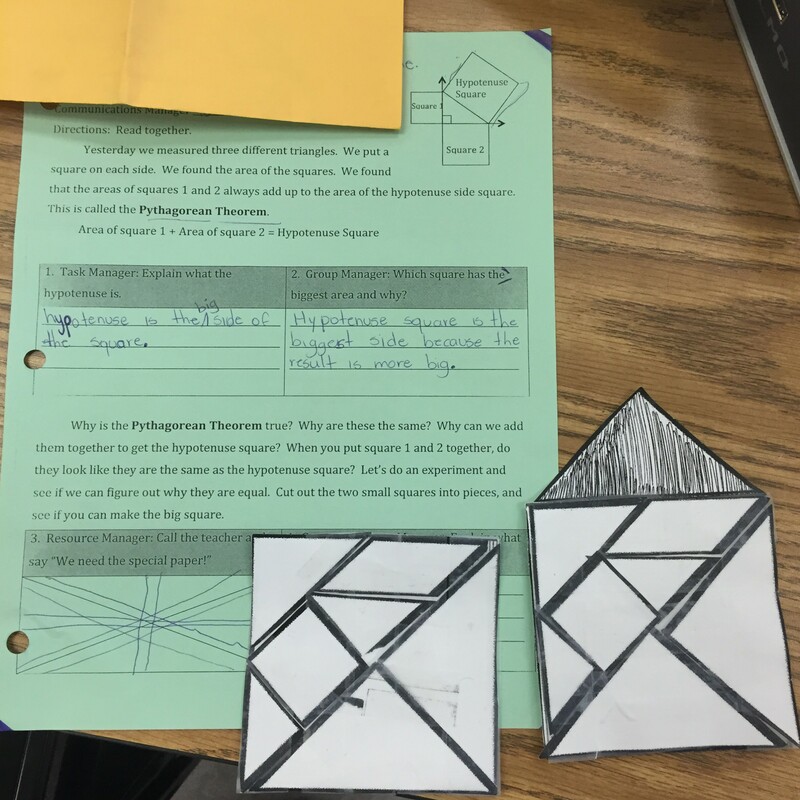 I’m also duly impressed with how hard the kiddos try to say “Pythagorean”. One of the structures that we’ve had success with this year is giving our kiddos (all English Language Learners) a word problem. They read it through, solve the problem, then write about it. 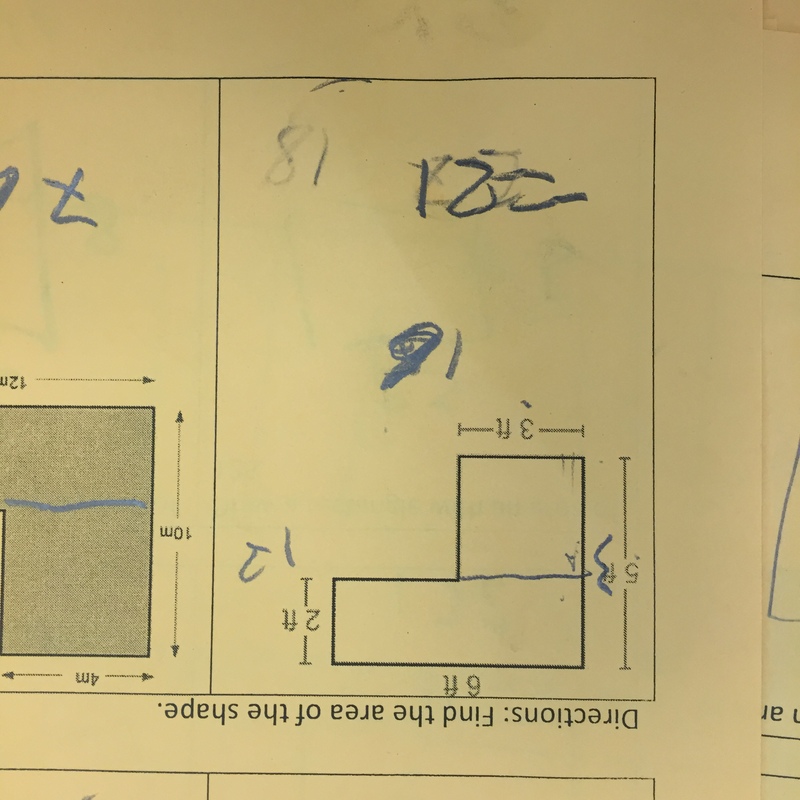 Initially, I thought it would be too easy, but I am constantly reminded how many new words there are to learn and seeing the problem in multiple ways (reading, drawing/solving, writing about it) seems to give students more access to it. 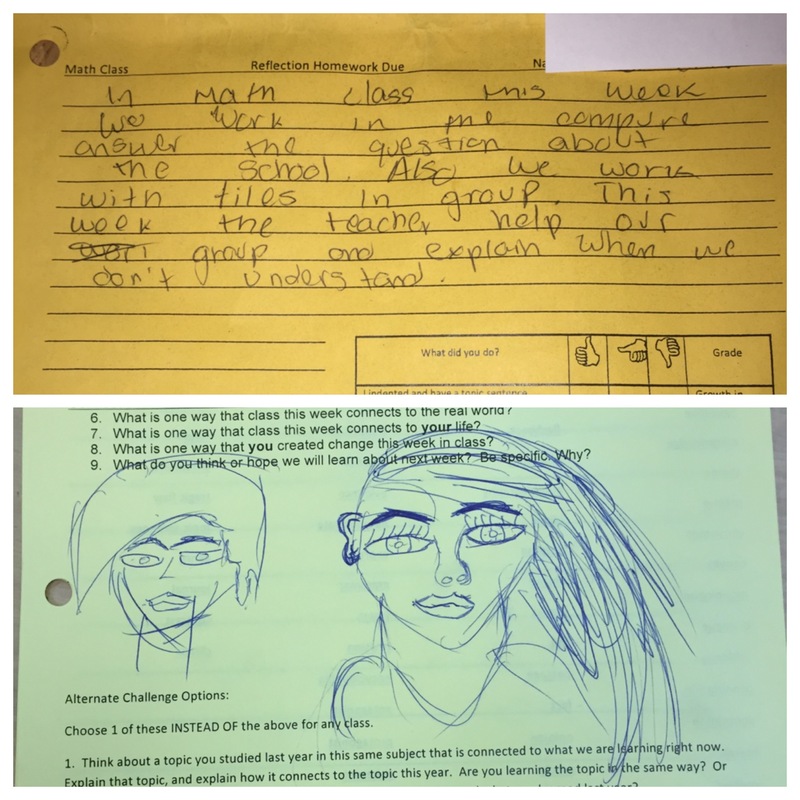 It’s also interesting to see how students react to word problems over time. Today, we were pressed for time, so we spent more time solving the problems than writing about them. And I think I’m OK with that. This particular student translated some of the words into English, which is a good strategy. 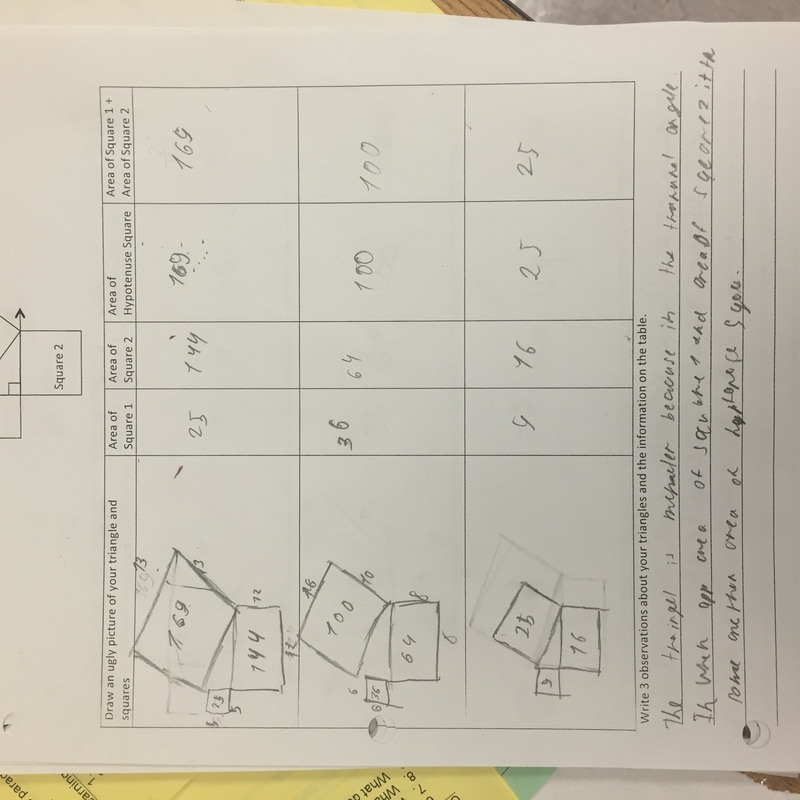 Many teachers talk about “pseudo-context” and how making up a word problem doesn’t necessarily engage students further. I think I agree with this, but for students learning English, word problems fulfill a need to learn new words that might not exist for other students. (This is not a measure of success, but many of our standardized tests, which ultimately do count for our students, are filled with words. I’ve seen so many students who can do the math work be stumped by words like “garden” and “astronaut”) Kiddos got stuck on words like “owner” and “porch”. Incidentally, many students translated “porch” as “espacio libre” (free space). In addition to prepping for tomorrow (which the curriculum partners largely did), I spent a bit of time after school trying to get ready for a Student Support Team meeting (which are called when there are students that need extra support for whatever reason). Multiple phone calls, etc. As a result, I may or may not have been late to another meeting (oops) where teachers from schools across the city to talk about implementing Complex Instruction at our schools. Pretty cool to hear what other people are doing. Came home, tried to go for a run, took a nap instead. Close. Spent today doing a reading guide on the Pythagorean Theorem. Reading guides are a structure at our school where students read together. In most classes, they learn and practice common reading strategies like visualizing, making predictions and inferences, etc. In math, they do these things as well though we often walk them through math problems as we go. Photo One: The Reading Guide and Tangrams The part of me that signs all my emails “The Worst” (ie “Sorry I haven’t email back #ImTheWorst” or “Sorry I totally Second Year Teacher’ed you when I flaked out on Friday #ImTheWorst”) will also confess to not having read the Common Core progressions in-depth* (though make no mistake, I’m fond of them). So I’m excited that we actually talked a bit about how to show that the sum of the area of the squares of the legs is equal to the square of the hypotenuse (we did not at all describe it in those words). We had students cut out tangrams of the two small squares and try to put them together over the big square. Most students were able to accomplish this, with a hint or two. (In the end, a bit of struggling seemed important, though it also felt useful to show students the result if they hadn’t discovered it) Incidentally, the two constructed squares in this photo were made by two friends in different classes (One student built the pattern in the morning, which I showed to the student I have in the afternoon when they started to struggle. They seemed impressed). Photo 2: Pythagorean Pronunciation Curriculum partner and I occasionally talk about words that are hard to pronounce. Trigonometry (which we never even taught – we just left it at sine, cosine and tangent) would have been tough, parallelogram is tough, Pythagorean Theorem (let alone “theorem”) is tough. That being said, kiddos have been super down to try, including this student who took notes when I wasn’t looking. *Just kidding, the ones for middle school geometry, where Pythagorean Theorem should be haven’t been written yet. Told you I hadn’t read them in depth yet. Previously, curriculum partner and I divided students in half. One of us taught kiddos about fractions. One of us taught the other kiddos about writing the steps to solve equations. Today, everyone was back together for the first time in a few days. 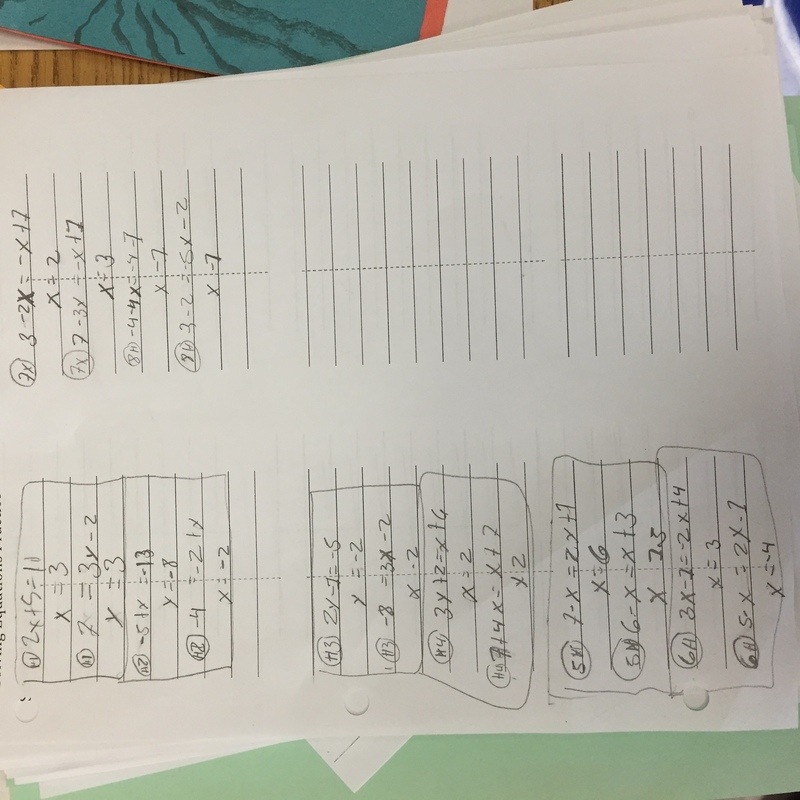 Students spent today working on a series of slow release equations – some with decimals and negatives for students who learned to write the solving steps and some with negatives for students who had studied fractions. Making seating charts is hard. I know some teachers are very firm about not ever letting students change groups. I will sometimes change groups if students advocate for themselves with a good reason (our kiddos also have all of their classes together for the whole day, so personalities can get more explosive as the day goes on). I’ve been trouble placing one kiddo. But today, he ended up working really well with his new group. They talked and worked and wrote together. His work is shown above. This year is the second year that we’ve used algebra tiles, so some of our kiddos are getting really good at using them. 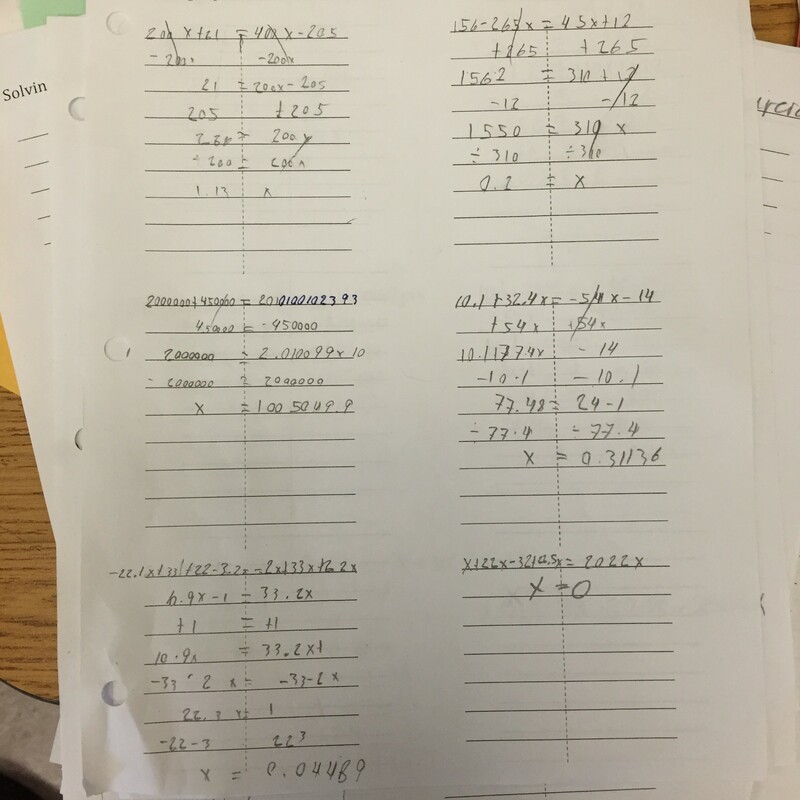 Today, most students who had only seen them this year continued using them to solve equations. 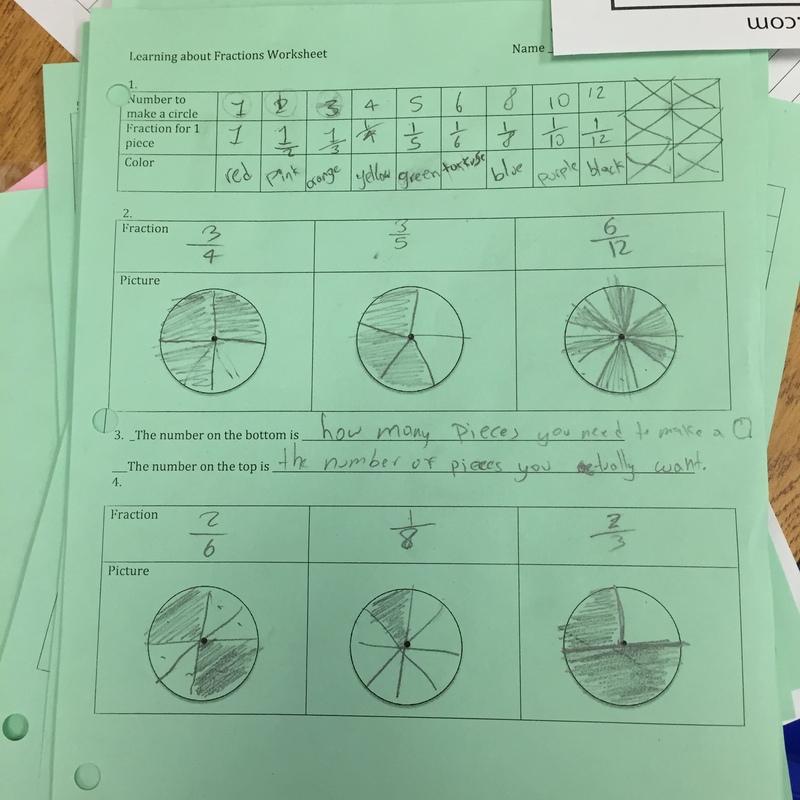 Their groups tended to be more homogenous than usual and it was really exciting to see some students really step up their algebra tile game. Since we haven’t taught these kiddos how to go from algebra tiles to writing the steps, I just had them write the equation and the answer. 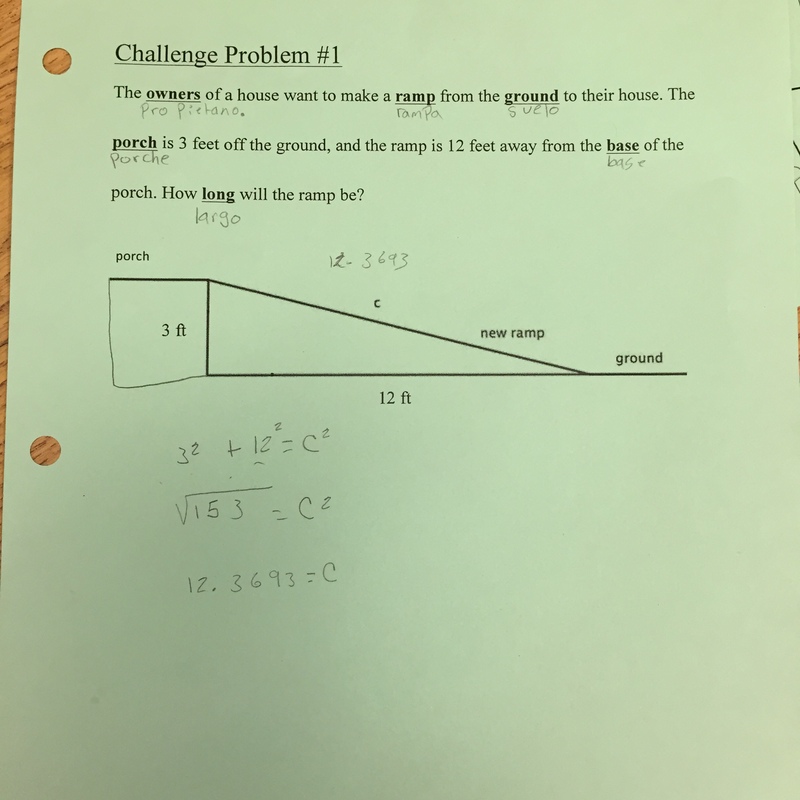 This photo is from one kiddo who was left alone (the rest of his group had to help out another class) and sat there for about 30 minutes and plowed through all the problems. Pretty cool.